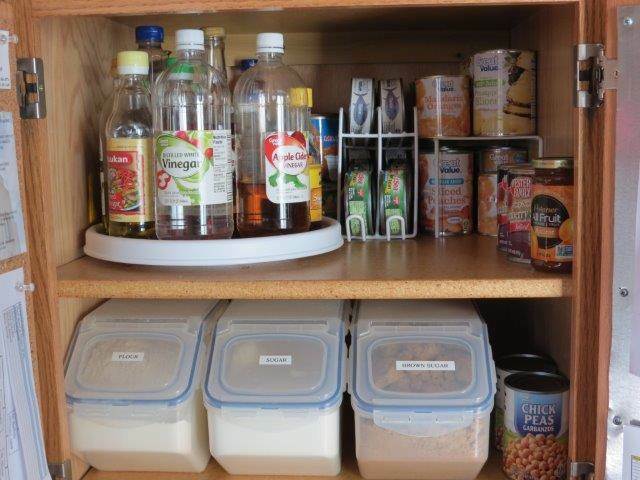 A deep pantry cabinet can be challenging to organize. It’s difficult to see and to reach items at the back, but it’s a waste of space to keep everything pushed forward. 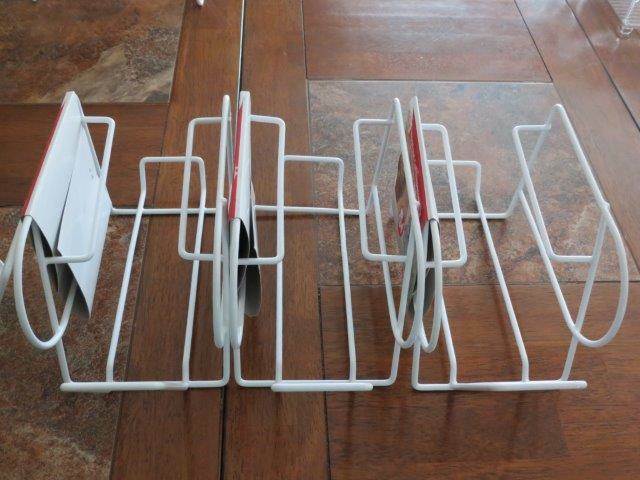 I have been struggling with this problem in my own kitchen since we moved in, but recently I was inspired with a solution. 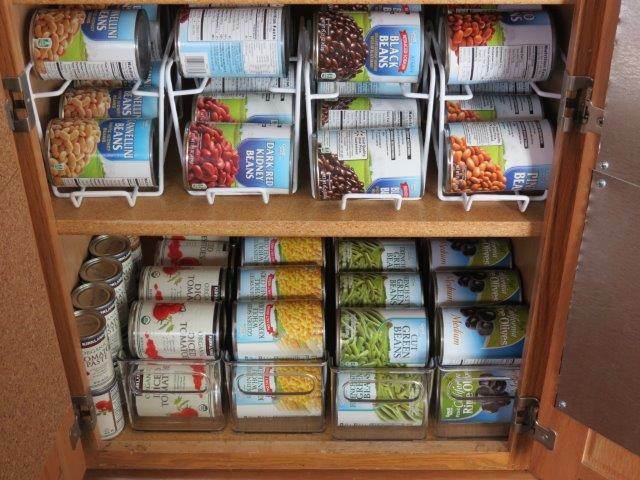 As you can see from the before photos above, I store a lot of canned goods in my pantry cabinet. I like to keep items grouped by type and arranged according to expiration date with the oldest items at the front. Given how tightly packed my cabinet was, this meant pulling out all the cans and rearranging them whenever replacement cans needed to be added. This is not something I have the time, energy, or disposition to do on a regular basis! 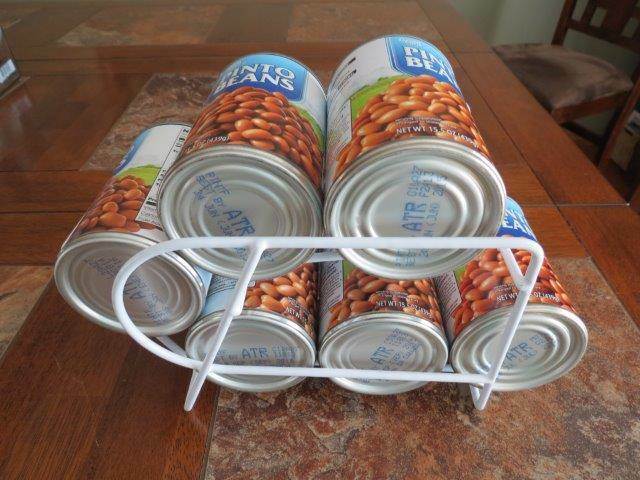 If only, I thought, there were some way to slide the whole row of cans out and insert the new cans at the back… And that is how I came up with the following solution. That thought: wouldn’t it be nice to slide the whole row of cans in and out of the cupboard with ease, was immediately followed by a vision of the clear, plastic bins I was using in my refrigerator. I rushed to the kitchen to test my theory and was pleased to discover that a typical can fits neatly on its side in the plastic refrigerator bin. 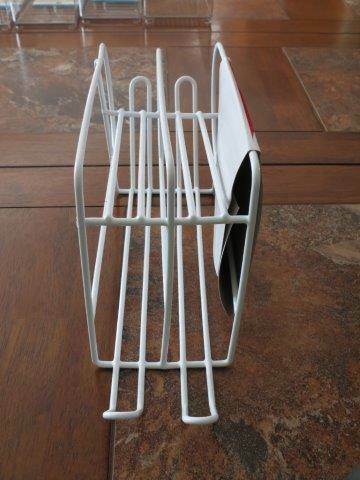 From the kitchen I rushed to the computer to shop online for refrigerator bins for my pantry! 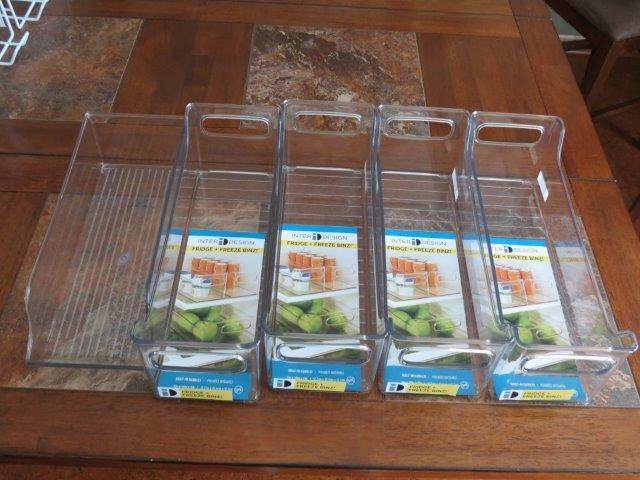 The bins I bought are by InterDesign. Each one is 5 in. x 14 in. x 5 in. 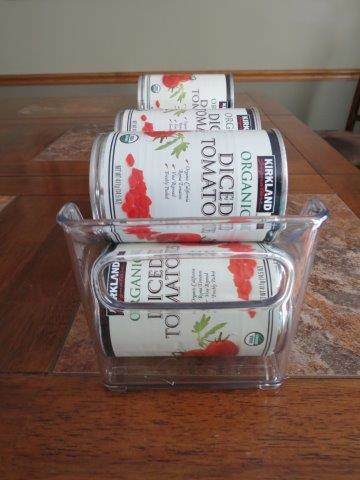 Each plastic bin holds five cans laid on their sides. 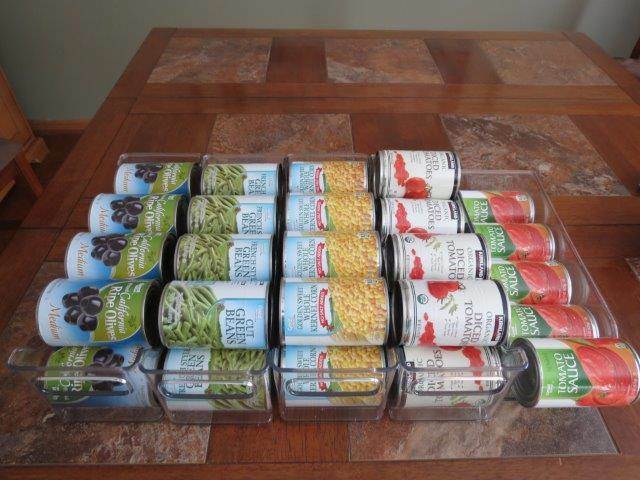 I added a second row of four cans stacked pyramid-style because I wanted to fit more into the cabinet. There is room to add another row on top of that, but I didn’t want it to become cumbersome. So far I am loving this solution. 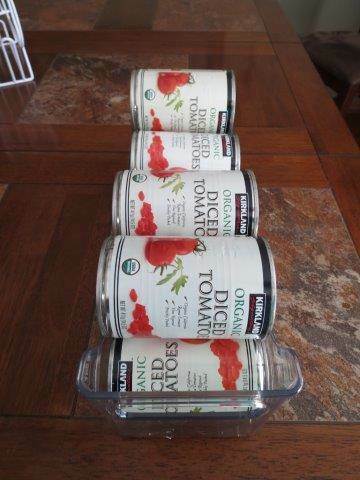 The cans look neat arranged in the plastic bins, and the bins function exactly as I envisioned they would. 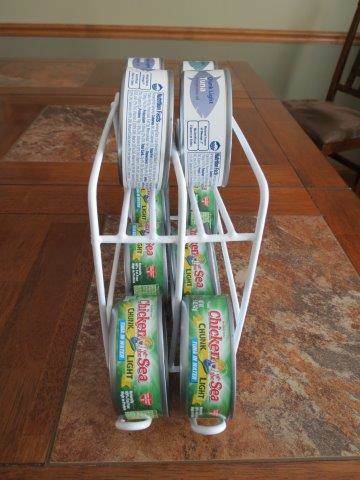 They slide in and out of the pantry cupboard with ease, and they are simple to restock. 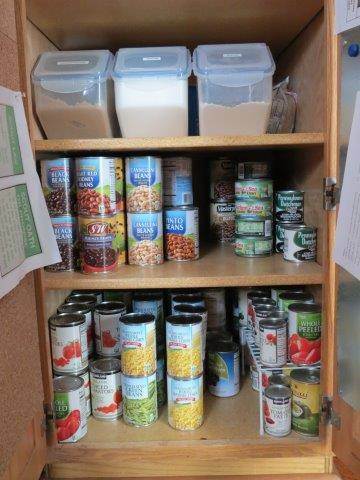 I even repurposed one of my actual refrigerator bins as a pantry organizer to supplement the four that I bought. It has a slightly different size and shape, but it works fine as well. 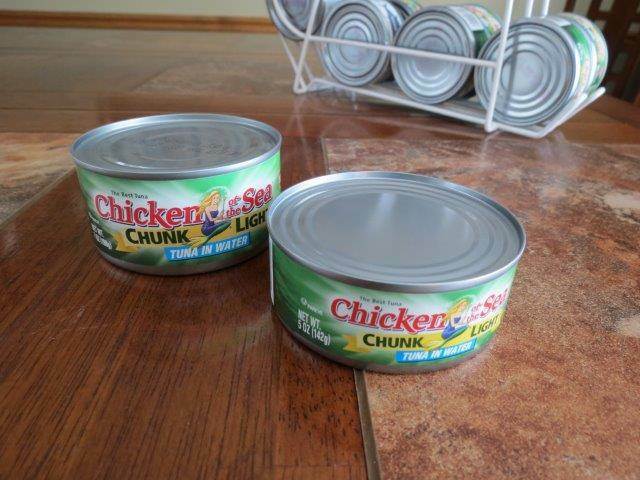 Note that there are two sizes of tuna fish can. The standard, smaller cans (5.5 oz.) 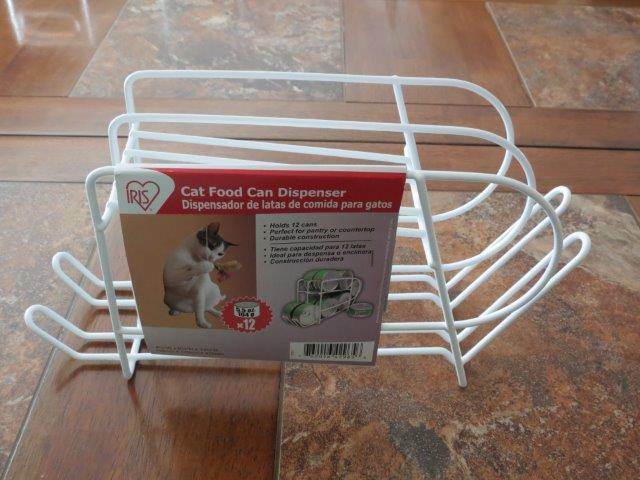 fit in the narrow (cat food) can dispenser, but the larger (7 oz.) cans stick. You can still store them in the dispenser, but they will not roll forward like they're supposed to when a can is removed. Here is what the pantry looks like now with the new storage system in place. 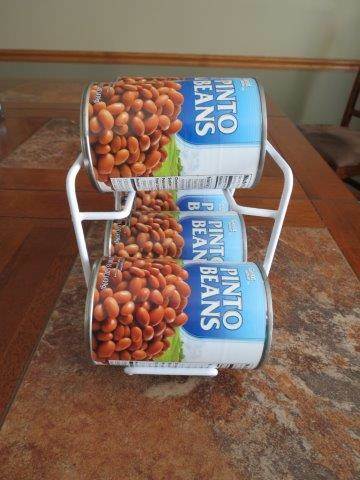 No more struggling to see what’s at the back of the cupboard or having to climb inside it to reorganize cans at the back of the bottom shelf. In case you're interested in replicating something similar in your deep pantry cabinet, here are links to the other products I used (or very similar products). Note: these are affiliate links. 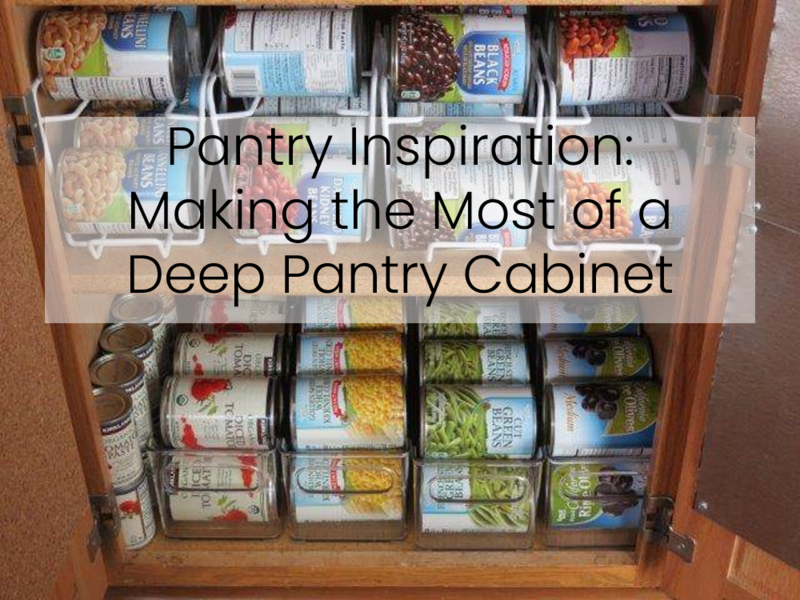 I hope the story of my deep pantry cabinet has inspired you to make sense out of yours. I wish you luck in your pantry organizing efforts. If you liked this page, please share it on social media. Leave me a note in the comments section below as well. 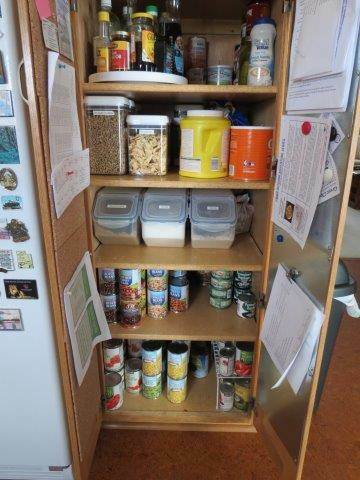 I'd love to hear how you have solved your pantry problems - or help you come up with a solution!